Passed away in Pemberton on the 28th March. Loved Father of Ryan and Matthew. Adored and proud Poppy of Charlie, Ella and Imogen. Family and friends of David Victor "Diver" Hughes of Pemberton, are invited to attend his Funeral Service, to be held in the Pemberton Community Centre, Club Road PEMBERTON commencing at 11.00am on FRIDAY (5.4.2019). 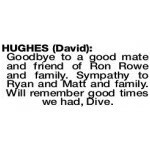 Goodbye to a good mate and friend of Ron Rowe and family. Sympathy to Ryan and Matt and family. Will remember good times we had, Dive.